DTE Maharashtra has released MAH CET Admit card on February 28, 2019 for the MAH MBA CET 2019 exam to be held on March 9 & 10, 2019. The last date to download MAH CET admit card is March 10, 2019. You can download MAH CET Admit Card 2019 by using your MAH CET login credentials from official MBA CET 2019 website of DTE Maharashtra. MAH CET exam is a computer based test and will be held in multiple sessions. There will be two sessions on each day of MAH CET exam. The Last date for printing of MAH CET application form is March 5, 2019. DTE Maharashtra has already closed the MAH MBA CET 2019 Registration on February 18, 2019 after giving an extension of three days. DTE Maharashtra had earlier announced to extend the last date to apply for MAH CET to Feb 18 from earlier Feb 15. The application process for MBA CET remained online only. Who Conducts MAH MBA CET? Directorate of Technical Education (DTE) Maharashtra conducts MAH CET exam every year not only for MBA admission but also for admission to Engineering, Architecture, Pharmacy, MCA and other courses. However, the information shared below is for MAH MBA CET 2019 for admission to various MBA/MMS courses offered by MBA colleges in Maharashtra to Maharashtra State (MS) and Outside Maharashtra State (OMS) candidates. To conduct the exam smoothly and without any technical issues in 47 cities of India, Government of Maharashtra has created a special State CET Cell within DTE Maharashtra. The candidates from Maharashtra as well as from all other states can appear in MAH CET. MAH MBA CET 2019 exam will consist of 200 objective type of questions without negative marking. The exam is divided in three sections and the time duration to complete the MBA CET exam is two and half hours. DTE Maharashtra has released MAH MBA CET 2019 notification on January 14, 2019 vide ref number CETCELL/ MAH-MBA/MMS CET2019/Notice-I/2019/108 with the complete MAH CET Schedule 2019. To facilitate MBA/MMS admissions through MAH MBA CET 2019 and other CET exams, the Government of Maharashtra has established "ADMISSIONS REGULATING AUTHORITY AND STATE COMMON ENTRANCE TEST CELL" as per the provisions of the Maharashtra Unaided Private Professional Educational Institutions (Regulation of Admissions & Fees) Act. 2015 (Mah. Act No. XXVIII of 2015). The Commissioner of State CET Cell is Competent Authority for conducting CETs. Jamnalal Bajaj Institute of Management Studies (JBIMS), University of Mumbai will offer Admission to its two years full time MMS 2019-21 batch through Centralised Admission Process (CAP) to be conducted by Directorate of Technical Education (DTE), Government of Maharashtra in June 2019 after MAH CET Result declaration. The registration and application process for DTE CAP 2018 would open around May 15, 2019 and will be online process. JBIMS Mumbai admission policy and admission process for MMS 2019-21 batch is not changed so far and therefore the B-school will accept CAT 2018, MAHCET 2019 and CMAT 2019 scores. The admission process will be through DTE CAP 2019 as was last year. Although JBIMS does not announce individual cut offs but the JBIMS MAH-CET cut offs as announced by DTE Maharashtra after different CAP rounds reveal a percentile cut off at 98-99 for JBIMS. All India Candidates seeking admission for 15% All India seats in MBA/MMS 2019 programmes in Maharashtra B-schools will be considered for admission on the basis of MAH CET , CAT 2018 and CMAT 2019, XAT 2019, ATMA 2018 & 2019 (Dec, Feb), MAT (Dec 2018, Feb 2019) entrance exam scores. Will DTE extend the last date to apply for MAH CET 2019? Although no such announcement has been made by DTE Maharashtra to extend the last date to register and apply for MAH MBA CET 2019, it is possible that the last date to apply for MAH CET may be extended by a few days beyond February 15, 2019. Can MAH CET 2019 Exam Dates Change? Yes, it is very much possible. DTE Maharashtra vide its ref. No. State CET Cell/Tentative Schedule/2019-20/2019 dated 20/12/2018 has clarified that in case of exigencies like Parliament Elections 2019, the dates may be changed. 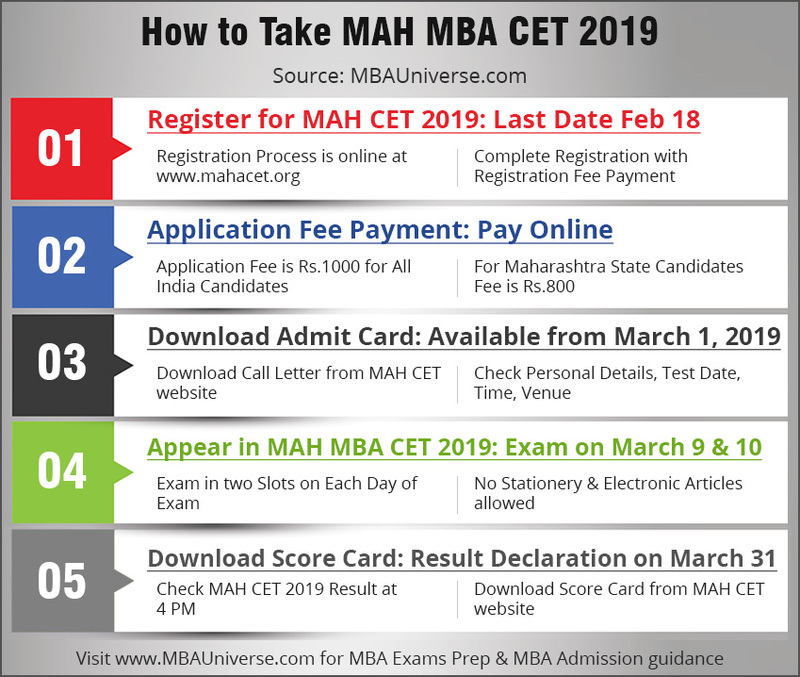 MAH MBA CET 2019 Registration Last date has got over on February 18, 2019 at 5 PM. MAH MBA CET 2019 exam will be held on March 9 and 10, 2019 in multiple sessions. The last date to download and take print of your MAH CET application form is March 5, 2019 from MAH CET official website. The extended MAH CET Application date from Feb 15 to Feb 18, 2019 did not increase the registration or application fee. Candidates were allowed to apply online only to appear in MAH CET. The application fee for MAH CET was INR 1000 for Open category and INR 800 for reserved category candidates. MAH CET 2019 exam for MBA/MMS admission will be held on March 9 & 10, 2019. MAH MBA CET 2019 will be held in multiple slots as an online computer based test. MAH CET leads to admission in AICTE approved MBA/MMS/ PGDM courses 2019 in 300+ MBA colleges across the state of Maharashtra. No structural and content based changes in MAH MBA CET 2019 exam are announced by DTE Maharashtra. MAH MBA CET 2019 Syllabus as released by DTE Maharashtra is broadly split into three sections although there are four sections in the MAH CET 2019 question paper. The MAH CET syllabus topics are at par with the syllabus prescribed for other national and state level MBA entrance exams. DTE Maharashtra will conduct MAH CET 2019 exam on March 9 & 10, 2019 in multiple sessions in 47 test cities for MBA/MMS admission 2019 in more than 300 MBA colleges of Maharashtra State. MAH CET 2019 exam on March 9, 2019 has got over now with many changes and surprises to the test takers. The MBA CET 2019 was marked with a lengthy and difficult Logical Reasoning but moderate Abstract Reasoning. While Quantitative Aptitude section remained moderate, Verbal Ability was on higher difficulty side. Overall exam difficulty level was similar to last year with expected cut off at JBIMS remaining around 140+. MAH CET DTE CAP Round Seats Matrix 2018 has been released by DTE Maharashtra. Before the final MBA/MMS 2018 seat allotment through DTE CAP round 2018, the State CET Cell of Maharashtra has released the provisional seat matrix for CAP 2018 for admission to MBA/MMS 2018-20 batch in various colleges affiliated to different Universities in Maharashtra. MAH CET 2019 Sample Paper to guide about the MAH CET question paper 2019 is released by DTE Maharashtra along with the release of MAH CET Notification and beginning of registration in January 2019. You can download MAH CET sample paper from the official DTE Maharashtra website for MAH-MBA/MMS CET 2019 exam. There is more than a month to practice for MAH CET exam after the MAH CET Practise Paper 2019 Download is available at DTE website. DTE Maharashtra has released a list of 325 MBA/MMS colleges participating in DTE CAP 2018 and accepting MH CET 2018 exam score for MBA/MMS admission. The 325 top MMS colleges accepting MAH CET score have total intake of 34173 seats and offer MMS/MBA and PGDM programmes. The admission is offered through DTE CAP 2018. You will be eager to know your MAH CET 2019 percentile and the process how to arrive at the accurate MAH CET percentile calculation, after taking your MAH CET exam in March 2019. The best MAH CET percentile predictor should give you the nearest MAH CET percentile calculation so that you may come to know whether you would be shortlisted by the top MBA colleges like JBIMS, SIMSREE, PUMBA, K J Somaiya among others for MBA/MMS/PGDM admission 2019 based on your MAH CET predictions of your percentile score.